As awareness of natural products increases, we're all using more natural, chemical-free health & wellness products for ourselves. We can provide the same benefits for our pets too. Pet Stop Pet Fence Systems of Alabama now introduces holistic pet wellness products from Leaf of Life Botanicals, produced exclusively for PetStuffWarehouse.com, our online division. We will offer an increasing number of these products throughout 2014, including healing and calming sprays and balms. We are also excited to offer Certified Pure Therapeutic Grade (CPTG) Essential Oils from dōTERRA®. You may have heard of holistic medicine for people, but did you know that you can seek and provide holistic pet care, too? When conventional methods or products are either not meeting your needs or don't match your lifestyle, holistic care could be the solution. We believe that there are many benefits to taking care of your pets using more natural methods to supplement quality veterinary care. The holistic approach is all about perspective and preventative care, seeking total wellness for your pet. By examining how every facet of your pet’s life impacts his health, we can help move them towards better balance between mind and body. In addition to diagnosing and treating health concerns, holistic care encompasses nutrition, exercise and complementary therapies as well. Many drugs simply mask symptoms of the real issue, while a holistic approach targets the cause of symptoms as well. 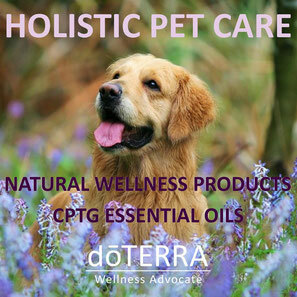 Complementary therapies such as essential oils, herbal supplementation, massage and chiropractic care are utilized in addition to conventional veterinary medicine. For a pet with arthritis, a holistic approach might involve the application of therapeutic grade essential oils, herbs with anti-inflammatory properties as well as regular massage therapy. The goal is to be minimally invasive and use as few prescription drugs as possible, avoiding unwanted side effects. dōTERRA® (meaning “Gift of the Earth”) essential oils represent the safest, purest essential oils available in the world today. Each of the dōTERRA CPTG Certified Pure Therapeutic Grade® essentials oils is carefully extracted by a global network of skilled growers, distillers, and chemists ensuring a consistently powerful user experience. They are pure aromatic extracts, contain no artificial ingredients, and are tested to be free of contaminants (such as pesticides or other chemical residues). In addition to being pure and natural, dōTERRA essential oils are subjected to additional quality testing that ensures the correct composition of the active natural compounds found in each oil. Even though an essential oil may be pure, if the right species or part of a plant has not been used, or if the plant has not been grown in the right environment or harvested at the right time, or if it has not been distilled under the right conditions, the natural chemical makeup of the extraction will not provide as predictable and powerful a benefit. In some cases, the wrong plant harvested at the wrong time may result in an extract that contains harmful levels of some constituents. Equally stringent standards of safety and efficacy are applied to all of the dōTERRA Essential Wellness products. Guided by our Scientific Advisory Board and Health-Care Professional Committee, dōTERRA uses only top development and manufacturing partners who maintain GMP certification and enjoy industry reputation for superior innovation and quality work product. Each dōTERRA product is guaranteed to exceed customer satisfaction for quality and efficacy.